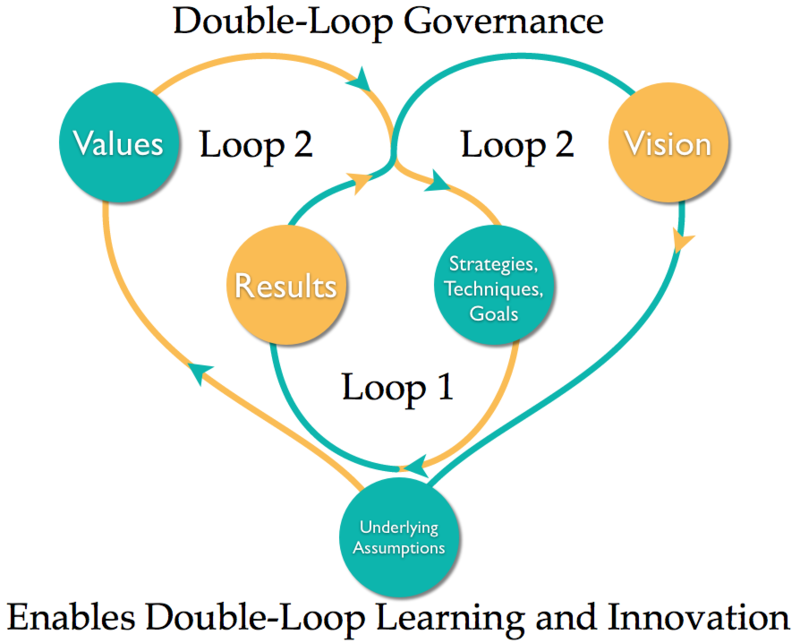 The concepts of double-loop governance and double-loop learning (Argyris and Shön, 1978) share a common ground in the communicative acts required to support these. Double-loop governance puts into practice what Argyris calls a Model II style of theories-in-use. A Model I “theory-in-use” for Argyris (1982, 8) represents the set of assumptions that a person puts into everyday practice without reflection. A Model I theory-in-use greatly resembles what Pierre Bourdieu calls a individual habitus (1990, 56). What a Model II style adds is a critical reflective moment. A Model II style is characterized by valid information, free and informed choice, and internal commitment (Smith 2001). Model II supports double-loop learning: an ability to question an “organization’s underlying norms, policies and objectives.” (Argyris and Shön, 1978, 2-3; quoted in Smith 2001). This ability—which all nimble online organizations require to keep up with changing codes and capabilities—needs to be established as a cultural goal of the organization. And for this, it needs to be a visible part of the organization’s governance scheme. This is what separates a double-loop governance effort from a single-loop governance structure linked to a management plan (or tied to a charismatic founder). “Governance is almost entirely based around values,” notes Jono Bacon (Bacon 2009), community manager for the Ubuntu distribution of Linux. “You need to not only understand your values, but celebrate them,” he concludes. In terms of double-loop governance, I would add that an organization needs to reflexively control (c.f., Giddens 1994: 122-123) its values, interrogate them regularly, and celebrate how robust they are. They are robust because there is an active process to reform and renew them as needed. Organizational management provides at least a single loop of internal communication and learning. Goals, strategies and techniques are attempted and their outcomes evaluated. On the basis of this evaluation, new goals, strategies, and techniques are attempted. The desired outcome of the single loop is an improvement in efficiency. This is essential Twentieth Century business management guidance. How business was done. This is also, in part, why so many Twentieth Century corporations are no longer here. Disruptive innovation and other rapid market changes cannot be addressed through efficiency alone. John Kao (2002) describes it this way, “We all want benchmarks to get the job done more efficiently. But this does not lead to disruptive, game-changing innovation, the stuff of which organizational renewal and competitiveness under conditions of uncertainty are all about.” (Kindle Locations 2686-2689). Government agencies are also good examples of single-loop governed, problem-focused, service-delivery organizations. They work under externally mandated goals and priorities. Even their single-loop quest for greater efficiency is sometimes constrained by legislative demands and regulatory road-blocks. These constraints provide a motivation for for agencies to partner with double-loop virtual organizations where disruptive innovation capabilities can be built into the working culture and governance framework. Clayton Christensen (2002) describes how the capability for innovation, and particularly for disruptive innovation, “…lies in the resources-processes-values (RPV) framework…” of an organization. (Kindle Locations 1962-1966). What Christensen found was that single-loop organizations (organizations that cannot reflectively question their underlying assumptions, values, and vision) create incremental, sustaining innovation that increasingly values high-margin results and high-budget customers. These organizations do not have the capability to pivot to take advantage of a disruptive innovation. Double-loop organizations will have processes that resemble those of the single-loop organization (trial and error, experiment and review, etc.). Efficiency and linear, sustaining innovation for progress to a desired goal: these are not abandoned. But they are embedded in the larger discussion of their relative return on an investment in their outcomes based on a larger vision that includes disruptive innovation opportunities. All of the thousands of PPTs with arrows connecting the end of a process to its evaluation and then back to the start of the process can still be used: with some necessary modification. These must include another loop out to “review assumptions and rethink and reapply values”. Posted on April 23, 2012 by Bruce CaronPosted in cybersocialstructure, governance, virtual organizationTagged double loop organization, double-loop, double-loop learning.